It's the anticipation that makes the holiday so delicious. Do you even have time to read this sentence? 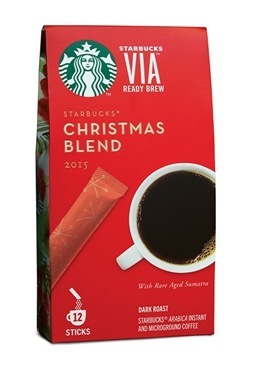 The holidays seem to come fast and furious and that's exactly why there's Starbucks VIA Christmas Blend. The mellow blend of smooth and spicy coffee is the perfect winter's pause. Made from the same signature blend of aged Sumatran coffee and other Asia/Pacific and Latin American beans, this Christmas Blend is an instant holiday classic. When you're making your list and checking it twice, remember that all you need is hot water and a single packet to enjoy.